Every CFO looks for ways to manage his or her organization’s accounting and financial software to make sure that it meets today’s ever-changing digital world. Intacct scores once again with its 2017 Buyers Guide to Accounting and Financial Software. CFOs will find this resource helpful in making the right buying and migration decisions. Read on for 6 tips we’ve highlighted from the guide on how to do just that. Is your financial system holding you back from getting good financial information? Is the evaluation process for cloud-based software different from evaluating traditional software? What are the 7 items you should get in writing before you migrate? Quickbooks, Oracle, Microsoft, and SAP each trace their beginnings back to the early 1980s. That means they were not designed for the internet and certainly not for today’s 24/7, robust data connections. You are most likely locked into a vendor by this point and you may find that changes to your current system are expensive, permanent, and time-consuming. Such inflexibility holds you back from creating the reports you need using real-time data that reflects today’s digital world. And that means your competitors using newer software solutions make decisions better and faster than you. on-premises model — You buy the license and run the software on your own in-house network. You are responsible for all costs related to deployment, operations, tech support, all other maintenance costs (including upgrades to both hardware and software). hosted model (single) — You buy a hosted service and a software like Citrix so your staff can remotely view the financial software that runs on the host’s network. You would not face responsibility for hardware and the accompanying upfront outlays but you will have to pay for customizations, upgrades, tech support and maintenance services. cloud-based model (multiple) — Offered as a software-as-a-service model by a cloud provider, this model provides a modern financial system solution, designed with the internet in mind. You have 24/7 access that you pay for with a per user/per month service charge. You avoid all the upfront costs and the maintenance and security issues. The 2017 Guide includes a helpful chart to explain the differences between the three delivery models with respect to variables such as application development, deployment, implementation, customization, hardware, and IT support. For example, implementation of the systems varies from 3-6 months for both the on-premises model and the hosted model while the cloud delivery system implements in just 6-12 weeks. 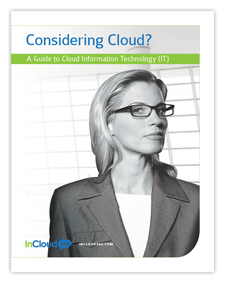 Your second decision: Is moving to the cloud the right move for you? Does your staff need to work in the field? Are you looking for increased speed in your financial system without increasing costs or staff? Do you need to integrate with SalesForce or other applications without costly reprogramming? Does your team need real-time dashboards to compete? Is your team struggling with processes that are inefficient? Does your business need to compete with larger businesses who have bigger budgets? If your organization answers yes to the above questions, then moving to the cloud may provide you with access to world-class infrastructure and let you compete on the world stage without the cost of developing and maintaining the infrastructure yourself. Your third decision: What to look for in a cloud vendor? Proven track record of implementation success. Proven track record of operational success. You will own your own data and can get copies of your data when the relationship ends. Know who are the infrastructure and security partners of the cloud vendor. Evaluate the vendors’ operation centers and their technology centers for security issues. Evaluate the ROI and the cost of operations for each cloud vendor to make sure they can do a better job than you can for a lower cost. Compare the standard support agreement for each cloud vendor and the various levels of additional support that you may buy. Investigate the people who will provide the tech support and whether the provider can give you the accounting and tax support that you may require. If you leave the vendor, you must get back your data. No questions asked. Vendor should respond to high priority requests within 2 hours and define what are low, medium and high priority issues. Vendor should supply three support contacts as well as a defined pathway for issues that need escalation to higher level support personnel. Vendor should announce maintenance activity in advance as well as the length of time that special maintenance activities may take. Vendor should provide updates on new product features and advance notes on upgrades. To learn more about buying accounting and financial software from Intacct’s White Paper, download the guide entitled “2017 Buyers Guide to Accounting and Financial Software”. To talk more about this topic, or anything else, please contact us. We are your resource for all your accounting questions.